The Fairfax Historical Society held its quarterly meeting on Sunday Night, November 16, 2003 with about twenty Fairfax and Westford residents present. A short business meeting was held and a special remembrance given to Larry Parsons, a member of The Board Of Directors in the Fairfax Historical Society who passed away on October 28, 2003. Larry was well known for his short stories about former Fairfax people, places and events. He truly had a unique way of expressing himself. Paul Lavallee has been asked to replace him on The Board Of Directors and has accepted the position. The meeting included a slide presentation of photos scanned from an old album owned by the Cain/Southard families. We were indeed fortunate that Clara Southard, who originally lived in the house across from Isabel Boutin and The Steeple Market and Gene Cain, former historian for Fairfax wrote comments and dates on the back of the original photos. Ralph Ellsworth and Elaine Lavallee also provided some very helpful information on many of the old time Fairfax, Westford and Jeffersonville photos. The photo which showed mules and a wagon with Sun Oil Company of New York (which apparently stands for SOCONY) raised a lot of interest. 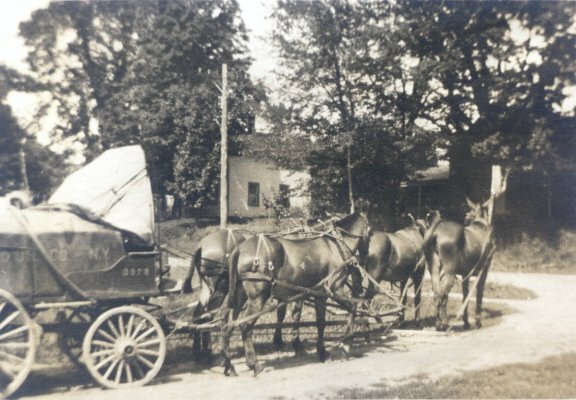 All of us truly wondered what was inside the wagon these mules were pulling as it sat there in the driveway of what is now the home of Isabel Boutin. A great time of reminiscing for the older folks who contributed to some new knowledge for the younger folks.